Howard Hathaway Aikens didn't think very much of J. Presper Eckert, Jr. and John Mauchly's plan to build electronic computers for a commercial market. And as the renowned inventor of the groundbreaking Harvard Mark I electromechanical computer in 1944, Aikens' opinion on such matters was important to military buyers. Based on the capabilities of computers in 1948, he argued that aside from the federal government's need for five or six machines there was no market for computers. By the next year, however, scientists, engineers and economists were actively discussing the usefulness of electronic computers in scientific and business applications. At a February 1949 meeting of the American Institute of Electrical Engineers, computer specialists eagerly dreamed of the day when computers would tune television sets, control manufacturing processes, fly airplanes and forecast the weather. Later that summer, a group of physicists meeting in Los Angeles imagined using a computer to answer questions about the motion of electrons. Economists wanted computers to predict how consumers' demands would change with reduced supply. 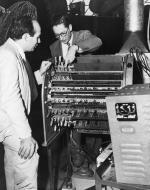 The need for high-speed computers to help solve large and complex problems was not lost on Eckert and Mauchly, who had developed the world's first electronic computer at the University of Pennsylvania during World War II. Since they had unveiled their ENIAC in December 1945, numerous companies had inquired about renting the computer. Embroiled in an ongoing patent dispute with the University over ENIAC, Eckert and Mauchly had resigned from Penn in March 1946 and started the Electronic Controls Corporation in an office at 1215 Walnut St. in downtown Philadelphia. Shortly thereafter they had drafted a brief business prospectus, "Outline of Plans for Development of Electronic Computers," which identified "scientific laboratories, universities and research foundations, industrial research and engineering laboratories, the U.S. Census Bureau, the U.S. Weather Bureau, other government agencies" as possible users of a "multi-purpose rapid computing machine of moderate cost." ENIAC had been a marked improvement over the differential analyzers and electromechanical computers then in use, but it had many shortcomings. A computer that could recall commonly used programs would require fewer technicians and be far easier to use. Agreeing that their next computer should be programmable and have memory, they sought the help of leading scientists, including Princeton mathematician John von Neumann, who conceptualized the benefits of a stored program computer. 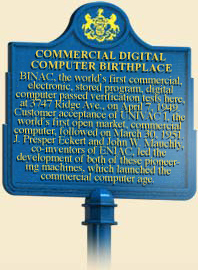 After reorganizing as the Eckert-Mauchly Computer Corporation in 1948, the partners assembled their first Binary Automatic Computer (BINAC) at the company's Ridge Avenue workshop. Bought in 1949 by the Northrop Aircraft Company, BINAC had a 1,024-word memory and user-friendly input devices, but it failed to work consistently. At the same time that Eckert and Mauchly were building BINAC, they were also developing a second, more sophisticated, reliable and user-friendly computer called UNIVAC (short for Universal Automatic Computer), which could recall data from memory. It also featured an input device modeled on a typewriter keyboard, an innovation suggested by pioneering computer scientist Grace Murray Hopper, who joined the Eckert-Mauchly Corporation in 1949. Hopper believed that computers should be easy to use and program. A former math professor at Vassar and lieutenant in the Navy WAVES during World War II, Hopper had outlined the fundamental operating principles of computing machines while working with the Aiken at Harvard University on the Mark 1. Eckert-Mauchly delivered the first UNIVAC I to the Federal Census Bureau on June 14, 1951. Favorable reviews soon induced other government agencies and companies to install their own UNIVAC systems. Commercial users were especially impressed by UNIVAC's use of data tapes, another major Eckert-Mauchly innovation, rather than bulky punched cards. In 1952, UNIVAC received a publicity boost when it appeared on CBS's television coverage of the Presidential election. Though the New York Times called the computer "more of a nuisance than a help," it did humble doubtful pundits when it successfully predicted Eisenhower's victory within 3 percent of his total 33 million votes. The Eckert-Mauchly Computer Company quickly sold forty-six UNIVACs to various government, military and civilian buyers, but budget overruns forced the partners to sell to the Remington Rand Corporation in February 1950. In the years that followed, Remington Rand's UNIVAC division, with Eckert serving as vice president, set the standard for commercial computer quality. In the mid-1950s, mathematician Grace Hopper developed Flow-matic for the UNIVAC II Data-Automation System, an English language pseudo-code, and pioneering programming language that laid the foundation for the development of Common Business-Oriented Language (COBOL), which helped revolutionize computer coding in the 1960s. Gradually, however, IBM and other competitors used improved transistors, integrated circuits, and other innovations to overcome Remington Rand's early dominance. The last UNIVAC I was retired from operation until 1970. An original UNIVAC I, the system that inaugurated the digital era, can be seen at the National Museum of American History in Washington, D.C.
Paul E Ceruzzi, A History of Modern Computing (Cambridge: MIT Press), 2003. Nancy Stern, "The Eckert-Mauchly Computers: Conceptual Triumphs, Commercial Tribulations" in Technology and Culture, 569-582October 1982.